Crowns and bridges are used to restore and enhance teeth that are damaged or to take the place of missing teeth. A crown (also referred to as a cap) is used to entirely cover a damaged tooth. A crown not only strengthens a tooth, but it can also dramatically improve a tooth’s appearance, shape and alignment. About 98% of the time I use CEREC 1 visit crowns. Lab fabrication of crowns is done 2% of the time and almost on all bridges. A bridge is an ideal method to fill the space created by missing teeth. A bridge is one or more artificial teeth that are cemented into place using the teeth on either side for support, hence the name. This is an option for filling the space created by a missing tooth. A bridge replaces the missing tooth, both functionally and cosmetically. Bridgework is as much an art as it is an exact science. The materials most often used now is porcelain over a zirconia base, porcelain fused to meal or infrequently gold. The choice of material depends on requirements for strength, wear and/or esthetics. It is important that a missing tooth be replaced as soon as possible for several reasons. If not treated the teeth surrounding the gap begin to shift inward. Since teeth use their neighbors for support, if one is missing they begin to erupt and shift into the open spaces. This may worsen the bite due to changes in pressure and can eventually result in problems with the jaw such as TMJ. To make a bridge or crown, we first take an impression of your mouth. The impression is sent to a dental lab where your crown or bridge will be custom made to fit your mouth and match your natural tooth color. A temporary crown or bridge will be placed into your mouth until your permanent crown or bridge is made. When the permanent crown or bridge is ready, it will be cemented into place. 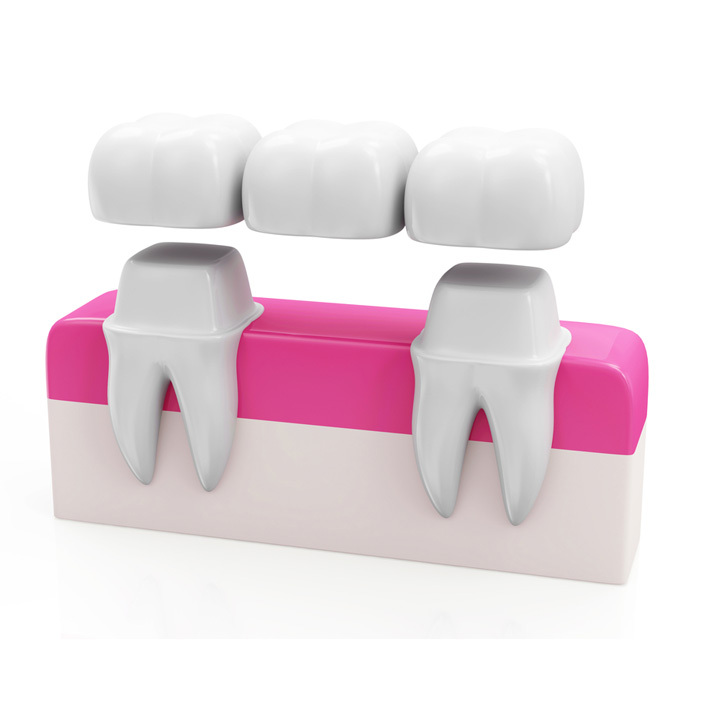 Bridges and crowns are very durable and can last a lifetime with extra care and by practicing good oral hygiene. An alternative to a bridge is: 1) an implant supported crown or 2) sometimes a partial denture.